Artist Scott McCorkle stands beside one of his 10 paintings hanging at Core Winery in Old Orcutt. Scott McCorkle adjusts one of his oil paintings on the wall at Core Winery while the winery's co-owner Becky Corey looks on. One of 10 oil paintings by artist Scott McCorkle is inspired by his experience living on an island in the South Pacific. "Spirits of Madame Pele" is an oil painting by Scott McCorkle. Inspired by a bed and breakfast located in Los Alamos, Scott McCorkle displays his art in frames that he builds from driftwood. Scott McCorkle's "Little Buster" was inspired by time in the South Pacific. Working within an industry driven by structure and calculated steps, local aerospace engineer Scott McCorkle, who began his technical career at Vandenberg Air Force Base, is not only making art these days, but making a difference. On March 2 from 4 to 6 p.m., Core Winery in Old Orcutt will host an artist’s fundraising art show and reception for McCorkle, displaying 10 pieces by the artist that are for sale with 100 percent of the proceeds going to benefit the Santa Ynez Valley Therapeutic Riding Program. McCorkle, a Santa Ynez resident and lifetime surfer, credits the knee surgeries he had a few years back that required down time from work as the catalyst for his expressing the dormant artist within. That, and inspiration from living in Hawaii and the South Pacific in his youth. "I just started painting," McCorkle remembers of laying out healing from surgery. "I'm a mechanical technician -- so it's obviously structured. It's been a lifetime of it. Art is a nice release because there are no rules." He kept on creating even after returning to work. 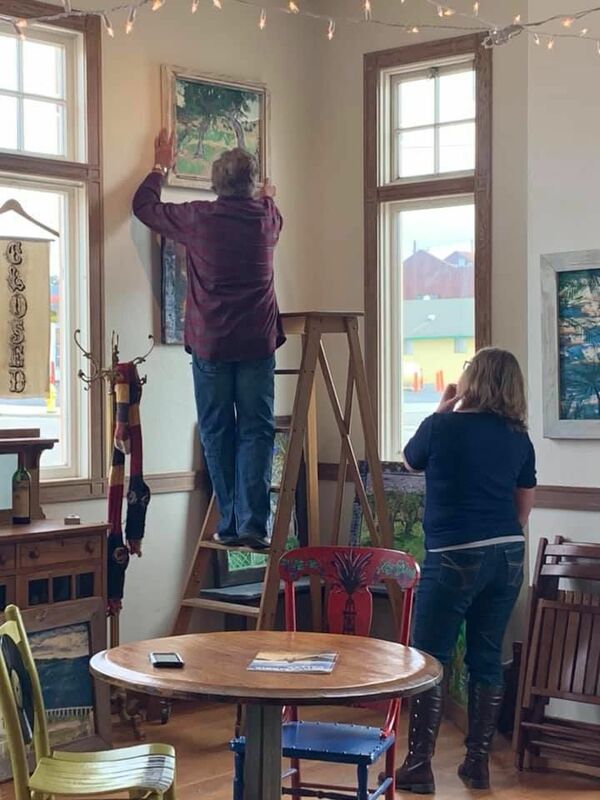 According to McCorkle, his friend Ron Cone nudged him to show his work, asking Core Winery's co-owner/operator, Becky Corey, if she would be willing to hang it. "Next thing I knew, Ron is telling me, 'Becky is a supporter of the arts and wants to see your art,'" he explained. "I usually just give my art away for free, so why not use the proceeds to benefit these kids who could use the money?" When McCorkle's daughter, Amanda, 36, was only 6 years old, she was diagnosed with a cancerous brain tumor. He said the combination of surgeries, chemotherapy and radiation at age 7 caused precipitous challenges that later resulted in her having strokes that affected her short-term memory and her ability to walk. "For instance, when Karie [his wife] and I went over to her house for Christmas dinner and left hours later, [Amanda] called us not long after, completely unaware that we had just been there," he said. "It's been a long time though, 30 years of one thing or another. But she's alright. She's a tough cookie," McCorkle said proudly of his daughter. "When you start to feel sorry for yourself, you have to remember there's always somebody worse off." Before needing a wheelchair, he said Amanda was a rider at the Santa Ynez Valley Therapeutic Riding Program, a nonprofit program that provides equine-assisted activities to children and adults with physical, cognitive, social, emotional and or other life challenges, regardless of their ability to pay. Karie is also a longtime volunteer coordinator there, training and managing program volunteers. Despite his daughter no longer riding, McCorkle understands the importance of the program, stressing that it isn't free and some kids really need the financial help to stay involved. "I'm doing it for the families that need it," he said. Oils to canvas, McCorkle’s work features irregular brush strokes and bright colors that depict Polynesian skies, landscapes and culture, as well as familiar scenes from the Central Coast -- as is evident in scenes featuring a serene barn set against the hills or a Los Alamos bed and breakfast, or even a favorite local surf spot. "I'm a surfer, so any sky starts to look like the ocean," he laughingly explained of the bright blue water and air pieces that seem to bleed into one another. And just to add an extra touch, McCorkle's paintings are cradled by the custom frames that he crafts by hand using beach driftwood and other reclaimed pieces. Admittedly lacking any formal artistic training, he chalks it all up to genetics: His mother was an artist; and says he never suspected that he too might possess these skills. As his work evolves, McCorkle continues to enjoy the lead that art has taken in his life -- and the surprises it still throws at him. He never knows where inspiration will come from or how a painting will change from where he thinks it’s going. "I'm never going to stop painting," he said. To learn more about the artist and to view his work, visit his Facebook page at www.facebook.com/scotffmccorkleart.